I have been asked a few times to write a “History of YBB” blog post and have been avoiding it. Why? Because the act of writing inevitably leads to a narrowing, a leaving out of people, events, and important nuances. There is so much to say and share! I feel the responsibility and wish to honor everyone who’s been part of this work and also realize that it’s impossible to do so. There are many ways to tell a story. Please check out our Milestones here (scroll to History), where you can see photos and highlights through the years, and of course our beautiful 10-year anniversary video by Kevmo. If you’re not mentioned by name in this post but are/were part of the evolution of YBB, forgive me and thank you. I wasn’t around during the early years when Shaina (Traisman) O’Neill Butler started teaching yoga at Seattle’s downtown jail aka KCCF. In 2003, fresh out of yoga teacher training, Shaina met a formerly incarcerated man at an activist camp. She was deeply moved by the man’s story of his many years in prison, and wanted to put her yoga training to work in prisons, starting in Seattle’s downtown jail. The stars aligned, KCCF was looking for a yoga instructor. It was a life-changing, heart-opening experience. The more she volunteered, the more clearly she witnessed the powerful effects of yoga on the lives of her students. Though solitary yoga teachers had come and gone before her, Shaina was haunted by the enormous need and the growing interest of students. In 2005, after conceding that she was only one woman, she decided to start a non-profit with the mission of reaching more students behind bars. Other teachers and enthusiasts stepped up to help. The first instructor to join was Natalie Cielle. Together, Shaina and Natalie reached out to more volunteers and expanded classes to include 6 prisons and youth detention centers. They also worked on a 501(c)3 application with several other dedicated volunteers. After almost two years of work Yoga Behind Bars was born in 2008. The first board members joined the cause, and the first instructors were trained, 10 in 2007, and 15 in 2008. All the work was powered by volunteer labor. In 2009, Shaina followed her heart to India, leaving behind a legacy in the Seattle community. Originally planning to be gone for 6 months, Natalie was made Interim Executive Director. In November 2009, when Shaina decided she was letting go completely, Natalie appointed Naiella Englund as Executive Director so that Natalie could hide in a corner from the title “Executive Director.” After 6 months, Naiella went on extended maternity leave and the Board recommended that Natalie stop hiding and take on the title of the role she was already playing. From that point onward, with Natalie fully at the helm, the question became “how do we support all these programs?” The original Board of Directors shifted considerably during this time of growth, with only Bruce Rutledge staying on for the ride. Suzanne Teachey came on board as teacher and Board President. She worked with Natalie to get the finances in order and set YBB on a path of sustainability. I, Rosa Vissers, joined as a volunteer in 2010, starting YBBs Development Committee, and fundraising events such as Gratitude in Motion. After years of work, the infrastructure started to slowly match the output and more program growth was on the horizon. In July 2011, we were awarded our first major grant (first ever grant, actually!) by local criminal justice reformers the RiverStyx Foundation. This was a transformative gift. 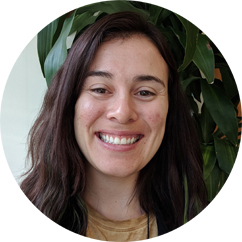 It meant YBB could hire Natalie as Executive Director, and also bring on board its first part-time Development Director, Olivia Silver, followed by Rosa in 2013. Having dedicated staff to focus on supporting students and instructors, as well as raising awareness and financial support was critical. During this time YBB had no official office space, yet we were offering class at more than 7 program locations and started to train more and more people in our methodology. In 2014, Natalie had to step back from YBB as she welcomed her daughter into the world. Rosa stepped into the role as interim ED, and eventually Executive Director (hey, didn’t we see a similar storyline earlier?). With the guidance of YBBs first Program Director, Nari Baker, YBB started to intentionally build a stronger analysis around systemic oppression, especially within the criminal justice system and yoga community. This work continues to this day. We are definitely a learning organization—we have made many mistakes—and we are committed to keep growing, learning, and showing up. Together with board members and people in the community, we started a Race and Social Justice committee in 2015 to facilitate this learning and showing up, both internally and in the community. Every year since then, we’ve hosted at least one public event with a focus on education and awareness building, such as a movie screening or a panel conversation. Our Trauma-Informed Yoga trainings include race and social justice training. We still have work to do, and we are grateful for all the organizations and people who have called us in, shared their time, and offered their expertise with us in this space. This has been true from the very beginning: YBB is fueled by the generosity of countless people. Without our volunteer instructors, we simply could not reach thousands of incarcerated students. Our teachers are at the heart of our work, teaching on holidays, driving far distances, stepping up time and time again to be a consistent and kind presence in prisons and jails all over Washington. We also have a very active board of directors. Their role is much more behind the scenes but no less essential. Over the years, the YBB board has changed to reflect the growth of the organization, both in focus and in who is represented on it. Especially in the early years, board members filled many gaps when we only had 1-3 staff members, while today the focus is more on long-term strategic direction. In 2015, after almost a year of preparation, YBB launched a Yoga Teacher Training for incarcerated men, one of the first of its kind in the country. 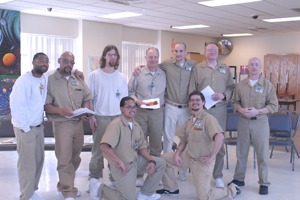 Participants were transferred from facilities across Washington State to attend this 6-month program at Stafford Creek Corrections Center. In 2016-2017 we offered a similar, but expanded program at Washington Corrections Center for Women. This program is still one of our proudest accomplishments and ongoing. Incarcerated and formerly incarcerated people are at the center of our work, and we work hard to have them be in leadership roles whenever possible. Today, we have 9 incarcerated instructors teaching classes at their facilities. You can read more about our teachers and this program in a Seattle Weekly article here. 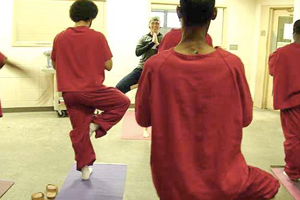 By 2017 we had almost 100 volunteer instructors offer yoga in prisons and jails all across Washington State. Our incarcerated teachers also started to teach classes at their facilities. Requests for more programs from incarcerated people kept coming in. Meanwhile our funding and staff team had not kept up with this growth. The amount of administrative work involved in managing programs within correction facilities is intense at best and overwhelming at worst. It requires a lot of focus, persistence, and patience. We were feeling the stretch (yoga pun intended). We love that we are almost entirely funded by the generosity of community members and a few visionary funders, but it can be and has been difficult. Every year we start almost entirely from scratch which proves challenging when trying to make long-term plans. We don’t receive any compensation from the Department of Corrections, government, or DSHS, in large part due to legal restrictions in the State of Washington. When a NowThis! Media video about us went viral in the summer of 2017 we were flooded with requests for help, resources, and opportunities to learn with us. How could we support all these people around the world, continue to serve our students and instructors, and not burn out in the process? The idea to share our 3-day Trauma-Informed Yoga training online was born: it would help us share our expertise and methodology AND be another source of revenue for our programs. We love win-win solutions! We launched a successful crowdfunding campaign and got to work. After more than a year of working on developing and recording the modules, we hope to launch our platform, hosted by our friends at Namastream, this fall. We are super excited. Our in-person trainings sell out within weeks and we know that not everyone can make it out to study with us in Washington State. We hope that the YBB OnlineTM platform will further build the movement for inclusive, resilience-building approaches to yoga. In addition to serving people interested in learning to offer Trauma-Informed Yoga, YBB OnlineTM also will provide yoga classes (all trauma-informed) for people looking for safe, accessible yoga to practice at home or other settings. I am always in awe (and often cry) when I think of all the love, energy, and commitment that has been poured into Yoga Behind Bars from day one. From our students, teachers, donors, board members, volunteers, the YBB staff team, and staff members at different prisons and jails. It’s remarkable. As we celebrate our 10-year anniversary as an official nonprofit we know that there is so much work yet left to do. And also, we have come a long way. Thousands of people have practiced and learned tools that are free and you can carry with you no matter where you go. This work is powerful and important. I bow deeply to all involved – past, present and future. Our staff team today is Administrative Coordinator Maggie Wegener, Development Director Amara Oden, Development Coordinator Alyssa Pizarro, Executive Director Rosa Vissers, Operations Director Ximena Narvaja, and Program Director Jess Frank. If you made it to the end of this post, congratulations and welcome to the ever-unfolding story!